The Japan Writers Conference is an English-language event held in a different part of Japan every year. There are usually about 30 presentations by writers in different fields on a variety of topics. At the sixth annual conference, last fall in Kyoto, I did some quick micro-interviews with a few of the presenters. I asked them what they had spoken about, what other presentations they had enjoyed, and what advice they might have for anyone thinking about going next time. You can see some of their answers in the video above. The seventh annual conference is coming up in November in Okinawa. You can find details on the official website here. More information will be added as the event comes closer. By the way, I once gave a presentation at the Japan Writers Conference myself. It was about how to interview creative subjects for feature articles, and you can see highlights of it here. You can also read my descriptions of some other writers’ past presentations here and here. One person who does not appear in this video is John Gribble, the main organizer of the event. But you can read a recent Japan Times article about him by Kris Kosaka here. 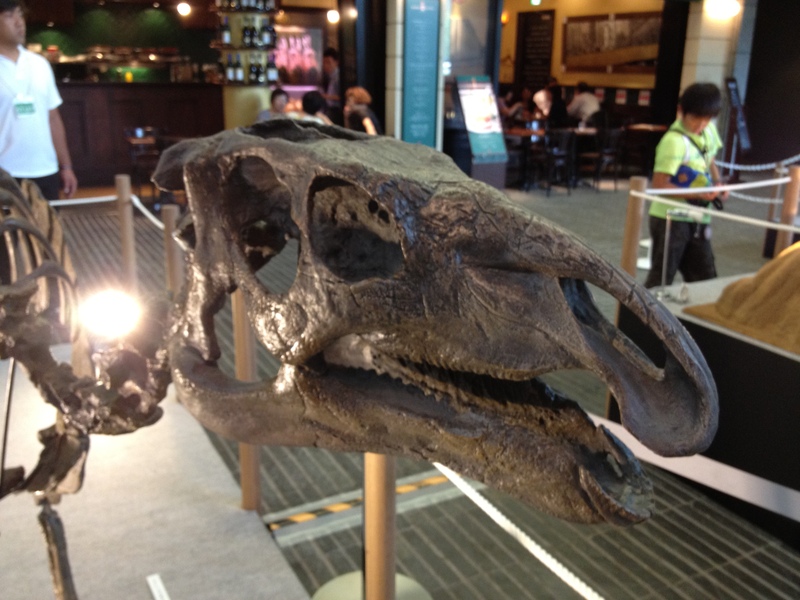 Last week, I visited a group of plant-eating dinosaurs that are on display at the Oazo Building next to Tokyo Station. Yesterday, I went to the Marunouchi area again to see the carnivores on display at the nearby Maru Biru. If you’d like to see them yourself, you’d better act fast. This is the last weekend they’ll be on display. Sunday, Aug. 18 is the final day. This is Part 12 of a 47-part series of almost-weekly blog posts looking at curries from each of Japan’s 47 prefectures. Japan is one of the richest countries on earth, and it got that way through international trade. But 150 years ago, Japan was neither rich nor international. After having been sealed off from the world by the Tokugawa shoguns for most of the 1603-1868 Edo period, Japan began to fully engage with other nations during the latter half of the 19th century. To successfully participate in world trade, Japan needed a product it could sell in great quantities. But it wasn’t an agricultural power, and when the 1968-1912 Meiji era began it had no large-scale manufacturing. However, it did have a comparative advantage when it came to silk. The Tomioka Silk Mill in Gunma Prefecture was the very model of a modern silk reeling factory. Set up by French businessman Paul Brunat under the auspices of the Meiji government, the plant began operations in 1872. 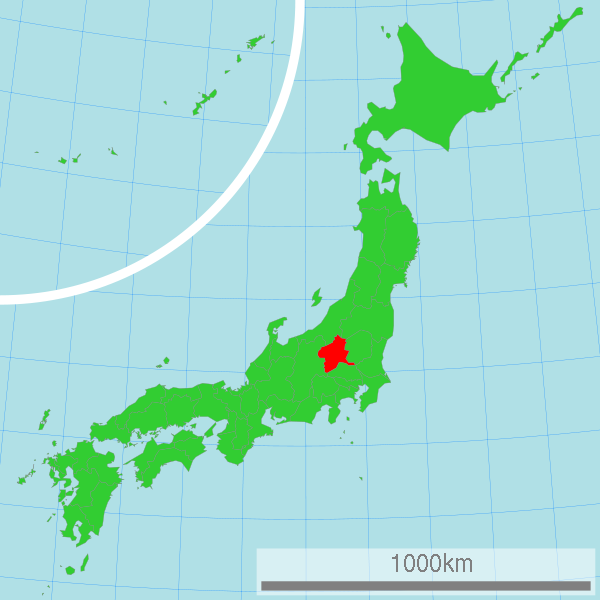 According to the plant’s official website, Brunat chose the location, about 100 kilometers northwest of Tokyo, in part because it was well supplied with coal, fresh water, and land suitable for growing mulberry trees. The women worked eight hours a day with Sundays off, apparently good conditions for the time. The Tomioka Silk Mill remained active until 1987. It is now maintained as a historic site. And now for the curry connection. I bought a 700-yen package of “Tomioka Silk Mill Curry” this week at the Gunma Prefecture antenna shop in Ginza, Tokyo. 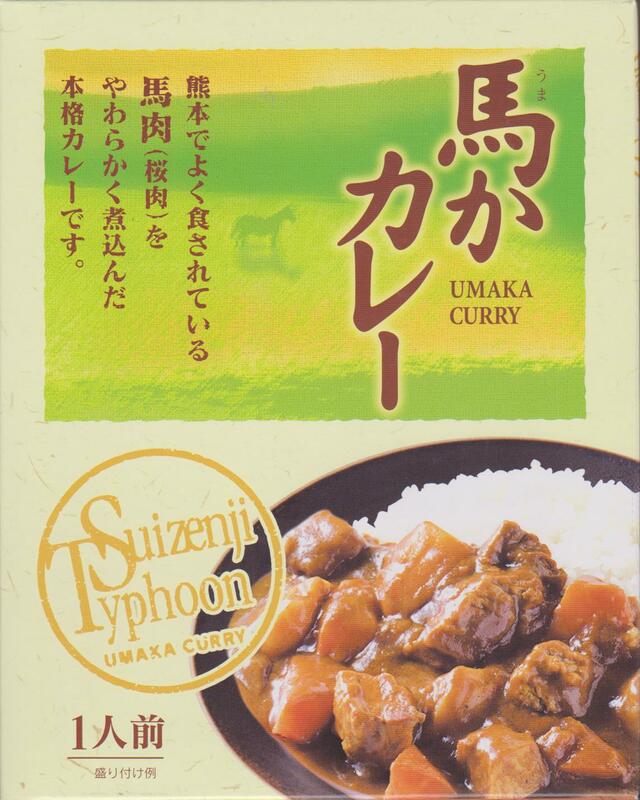 The product’s full Japanese name literally translates as “Curry loved by the factory girls at the Tomioka Silk Mill.” There are two individual servings in a box adorned with historical pictures. One of them shows women walking across the factory’s brick floor in thick-soled wooden geta – an image combing ancient and modern aspects of Japan in the Meiji equivalent of today’s geisha-with-a-smartphone cliché. In a whimsical touch, the box claims to be the exact size and shape of one of the factory’s bricks. As delightful as the packaging may be, I found the curry rather ordinary. It was very thick and dense, with a consistency similar to that of whipped potatoes. It was moderately hot, but there was no particular complexity to its spiciness. The first listed ingredient is pork, but there were only three bite-sized squares of dry, stiff meat in one of the servings, and three in the other. The next seven ingredients are onions, brown roux, curry powder, vegetable oil, sugar, flour and salt. Coffee appears further down this list. This would have been an exotic ingredient in 1872, but less so in 1987. However, no date for the recipe is given. 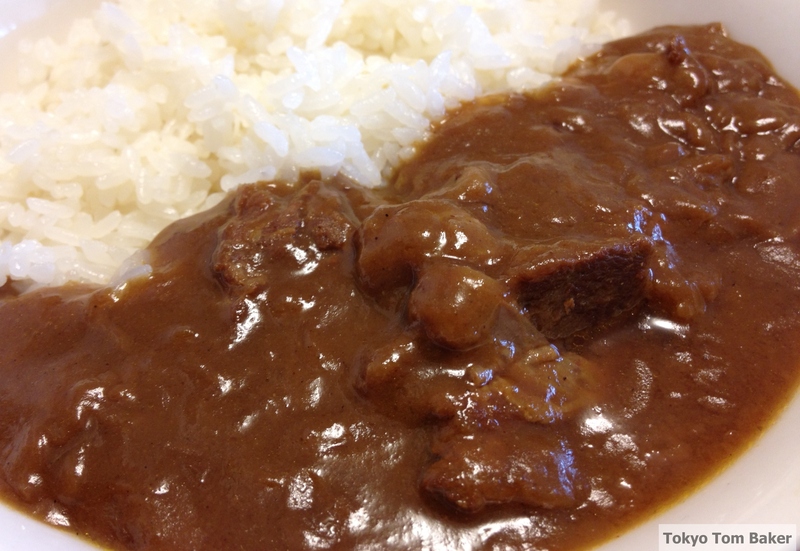 The curry was not served at the factory itself, but at a nearby restaurant called Takata Shokudo that is said to have been popular among the workers. 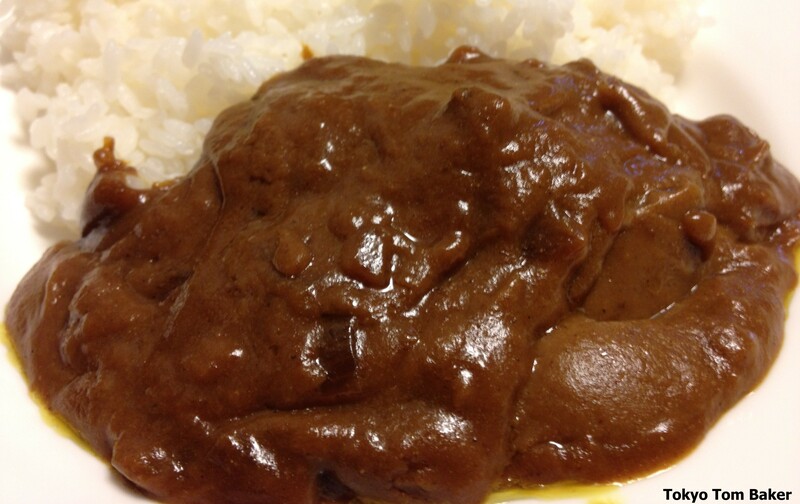 A Japanese food blogger who visited the restaurant has posted photos of the curry that look a lot more appealing that what I ate. (See them here.) There appear to be bigger pieces of meat, and there are also big chunks of onion. The onion in the version I sampled had been boiled or pureed beyond recognition. I suppose that like most restaurant food, this curry is best when eaten in situ. 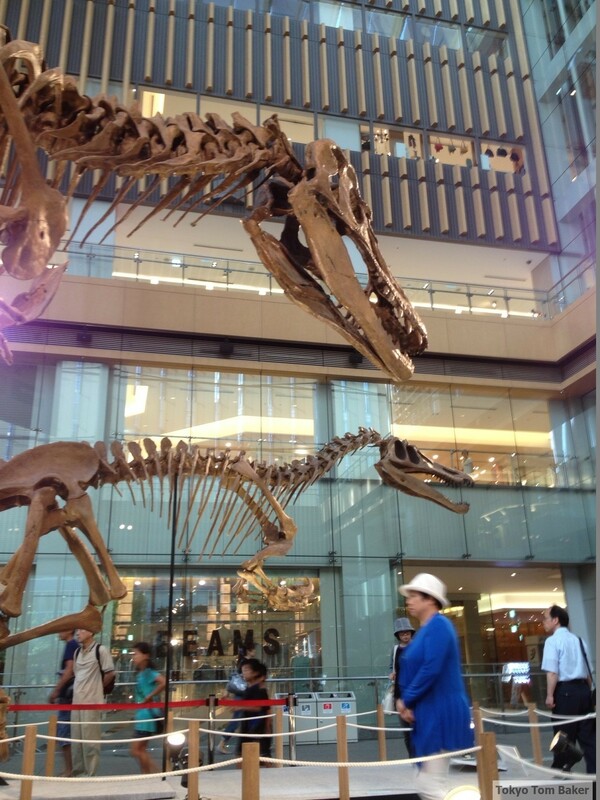 On a quick lunchtime visit to the Oazu Building near Tokyo Station the other day, I ran into some dinosaurs. There were three complete skeletons set up in the building’s atrium, including an eight-meter-long Tsintaosuarus (above), which can best be described as a duck-billed unicorn. The periscope-like projection from the top of its head is so bizarre that when the first one was discovered some scientists thought the skull had been broken and deformed in the process of fossilization. But later they found another specimen that fit the same pattern. Weird as it looks, it’s real. There was also a cute little skeleton belonging to a juvenile Apatosaurus. This is the creature formerly known as bronotsaurus, so by “little” I mean it was the size of a Great Dane. 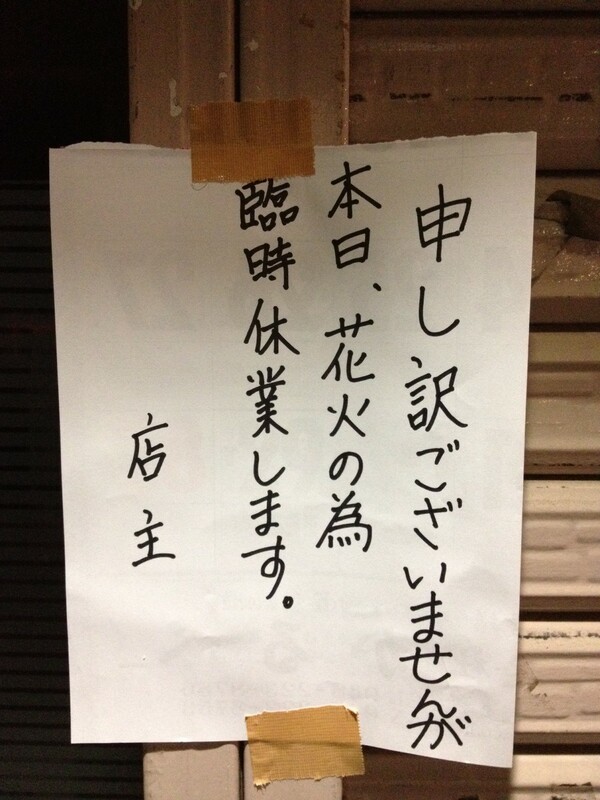 According to explanatory signage in both Japanese and English, it is very rare to find such a complete skeleton. In fact, even this “complete” skeleton was found without a head, so the skull is a reconstruction. Probactrosaurus visits a cafe at the Oazo Building. Judging by his plant-eater’s teeth, he probably ordered a salad. The dinosaurs I saw at the Oazo Building were all plant-eaters, but a collection of meat-eaters is also on display at the nearby Maru Biru. These include a 10-meter-long Baryonyx, which resembles a T. rex with powerful claws and a crocodile’s head. It apparently specialized in catching fish. 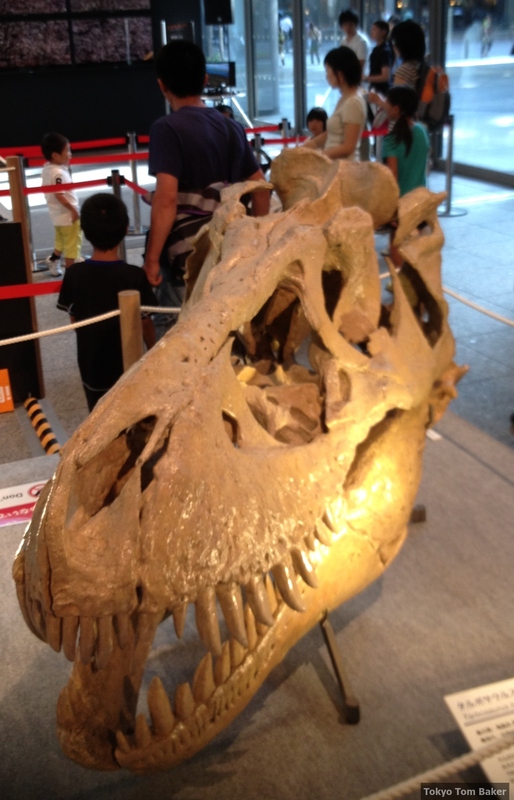 The skeletons, on loan from the Fukui Prefectural Dinosaur Museum, also include Japan’s very own Fukuiraptor. 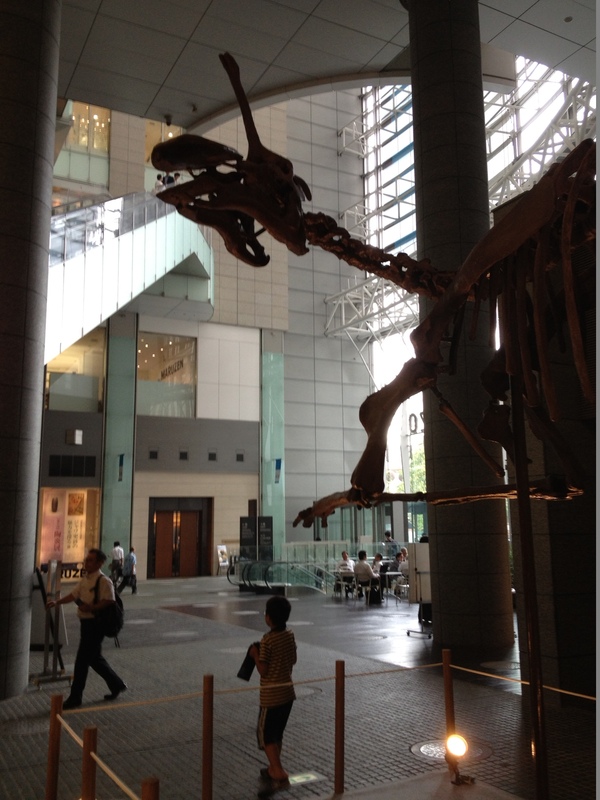 I didn’t have time to visit the meat-eaters and see the Fukuiraptor for myself, but I plan to drop by soon. The display runs through Aug. 18. See official details in Japanese here. This is the exact equivalent of the classic American “Gone fishing” sign – which is something I have never seen in real life. The establishment is called Sora Dining. It’s a tiny little bar and eatery that appears to have no website, but it is easy to find just half a block north of Kawaguchi Motogou subway station. I ate there once a long time ago and always meant to go back. Now I’ll really have to make a point of it. This is Part 11 of a 47-part series of almost-weekly blog posts looking at curries from each of Japan’s 47 prefectures. So hungry you could eat a horse? Then you should visit Kumamoto Prefecture, where horse meat is a well-known feature of the local culture. This makes Kumamoto distinctive, since meat of any kind has played only a small role in the history of Japanese cuisine. In fact, eating it was usually taboo. In her fascinating book “Modern Japanese Cuisine,” historian Katarzyna J. Cwiertka writes, “The first decree prohibiting meat eating in Japan was issued in AD 675.” Today it is commonly believed that such rules were based on Buddhist beliefs, but Cwiertka argues that the real purpose was to protect big livestock – horses and cattle – needed for plowing and transportation. Once the ban was in place, Buddhism may have reinforced it, but it seems to have applied mainly to domestic animals rather than wild game. How, when and why eating horse meat took particular root in Kumamoto is unclear, but one theory (described in an article by Jesse Veverka) holds that Kato Kiyomasa, daimyo of what is now Kumamoto prefecture, on the southwestern island of Kyushu, sanctioned it in response to a war-induced famine in the 1590s. Nowadays, horse accounts for almost exactly one percent of Japan’s annual meat production. 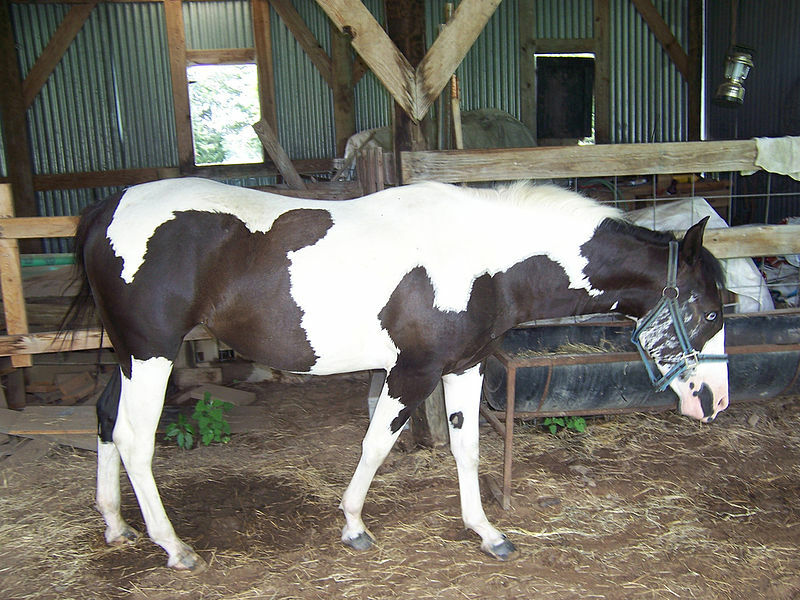 Of approximately 500,000 tons of meat produced domestically each year since 2009, about 5,000 tons comes from horses. Japan imports horse meat, too – roughly 1,360 tons in the first four months of 2013, compared to about 45,800 tons of beef imported in the same period, according to agriculture ministry statistics. That’s a lot of meat, and there are a lot of ways to serve it. In her handy reference book and dining guide “Food Sake Tokyo,” Yukari Sakamoto writes about horse meat, “The lean meat of the neck is eaten braised or ground; the tender parts like the fillet are eaten rare; the back leg, rich in fat and collagen, is slow-cooked for a long time so that it becomes tender. The liver, sliced thinly, is sometimes eaten raw.” She goes on to describe additional preparations, such as sashimi-style raw horse (basashi), grilled horse and a shabu-shabu-style hot pot dish called hari hari nabe. I’ve eaten basashi at izakayas a few times over the years, dipping slices of the meat in soy sauce with grated ginger. Perhaps I haven’t gone to the right places, but I’ve found the meat to be overly chewy and not memorably flavorful. It’s not at all unpleasant, but it struck me as being in the category of things one eats just to say one has eaten them. It was a rather mild curry, but the spiciness was dialed down without being replaced by the overt sweetness that often characterizes mild curries in Japan. The sauce reminded me of what you might get if you made a standard brown gravy with meat drippings, thickened it with more than the usual amount of flour and then added just a dash or two of cayenne pepper or chili powder. When I checked the ingredient list, sugar was more prominent than I had expected. But then, sugar is in everything these days. Otherwise, the main ingredients bore out my first impressions. The top nine were horse meat, fat (beef and pork), flour, sugar, starch, salt, curry powder, fond de veau (veal stock), and sautéed onions. In addition to the main meat, there were a several other umami ingredients such as tomato sauce, cheese and pork bouillon. There were also a few surprise items such as banana, honey, peanut butter and cocoa. This was a nice curry. I enjoyed it without finding it particularly exciting. I think my timing may have been off. If I had eaten this horse meat curry on a cold winter night instead of a hot summer day, I’m sure I would have found it immensely satisfying. You are currently browsing the Tokyo Tom Baker: The Blog blog archives for August, 2013.